The image depicted here is probably the sort of thing that many people picture when they think of the first Thanksgiving. I remember images like this pinned to bulletin boards in my elementary school classrooms and it has stuck with me. Although not completely accurate, it is a fair enough representation of what took place. We all know this event took place in Plymouth, Massachusetts. But did you ever wonder where, specifically, this scene played out? For locals, or people visiting Plymouth during the holiday, it might be of interest to know where the first “Thanksgiving” took place. Before we get to where, a little bit about the image itself and what actually happened that fall in 1621. The painting was done around 1912 by artist Jean Leon Gerome Ferris. Ferris was born in Philadelphia in 1863. He produced this painting as part of a series of 78 depictions of important moments in American history which he called “The Pagent of a Nation,” the largest such compilation of artwork. There are several inaccuracies. The Native Americans, most notably, are depicted in the garb of the Plains tribes. This was a common error in artwork of the time…people were more familiar with the Plains tribes than they were with the eastern woodland Native Americans. The Wampanoag who participated in the first Thanksgiving dressed differently and did not wear the stereotypical feathered headdresses. Also, there really ought to be more Native Americans. According to Winslow’s account, there were about 90 Wampanoag and roughly 50 English at the celebration. The house in the background isn’t quite right (they probably did not have stone chimneys and the exteriors were most likely shingled). The thatched roof is likely correct and its construction as depicted is certainly better than the log cabins shown in most artwork of that era. The Pilgrims did not build log cabins. That said, there are some clever details in the painting that show that Ferris did his research. The fellow standing at far right is Edward Winslow. There exists a painting of Edward Winslow, the only known portrait of one of the Pilgrims, in the collection of Pilgrim Hall Museum in Plymouth. Ferris copied Winslow’s face and put it in his Thanksgiving depiction. The Winslow portrait was done 30 years after the first Thanksgiving, so Winslow ought to appear rather younger, but still, it’s a nice touch. The presence of the spaniel shows that Ferris read William Bradford’s journal. Bradford mentions that a spaniel and mastiff were brought on the Mayflower. And the clothing of the English settlers is generally accurate…much better than the black suits, white napkins and buckled hats that somehow worked their way into most depictions of Pilgrims during the late 19th and early 20th centuries. Leyden Street in Plymouth, Massachusetts. The first street laid out by the settlers in 1621 and the location of the first houses, long since gone. The present houses date to the 18th and 19th centuries. They did not call it a “thanksgiving.” That term was in their vocabulary but such events were religious observances–days of prayer and feasting. What took place in the fall of 1621 was a celebration on the part of the English settlers that they had survived their first year and managed, with the help of the Wampanoag, to raise a successful harvest. It was probably inspired by the traditional English harvest festivals rather than any religious tradition. The exact month is not mentioned but the event likely took place in September 1621. With roughly 140 participants, this was no small celebration. There was no one table around which they all gathered, as shown in some depictions. And it took place over the course of three days with hunting, feasting, military drills and games. So, when you consider where this all took place, given the size of the celebration, it likely happened all throughout the village of Plymouth. 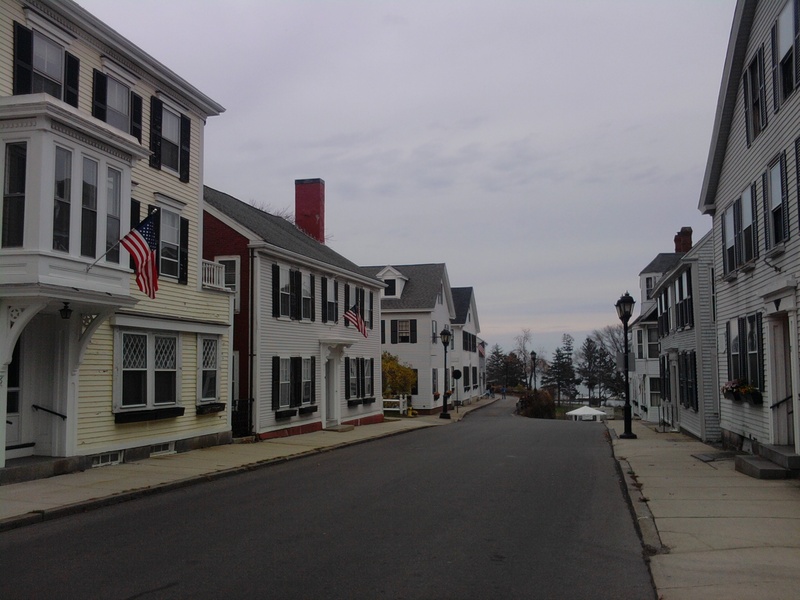 The first street built by the English settlers, along which they constructed their primitive houses, is now known as Leyden Street in downtown Plymouth. At the head of Leyden Street is Town Square. This is the street recreated at the living history museum, Plimoth Plantation, as it appeared in the 1620s. Town Square, Plymouth, Massachusetts. The center of the original Pilgrim village. The Bradford Building is on the right. There was a town common of sorts in 1621. It was a space left open between John Alden’s house and William Bradford’s house where the militia could drill. 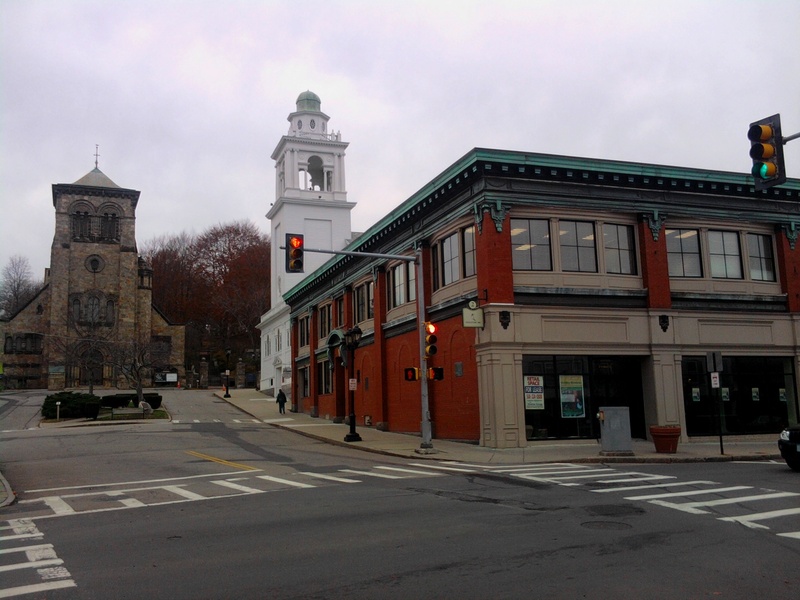 The location is now occupied by the Bradford Building at the corner of Town Square and Main Street. This open space would have been a convenient place for an outdoor feast and games. I have always thought of that spot as the epicenter of Thanksgiving although there is probably no single spot that you can point to. It is interesting to look at that block today and to try to imagine the festivities that took place there nearly 400 years ago–an event remembered by virtually the entire nation once a year. 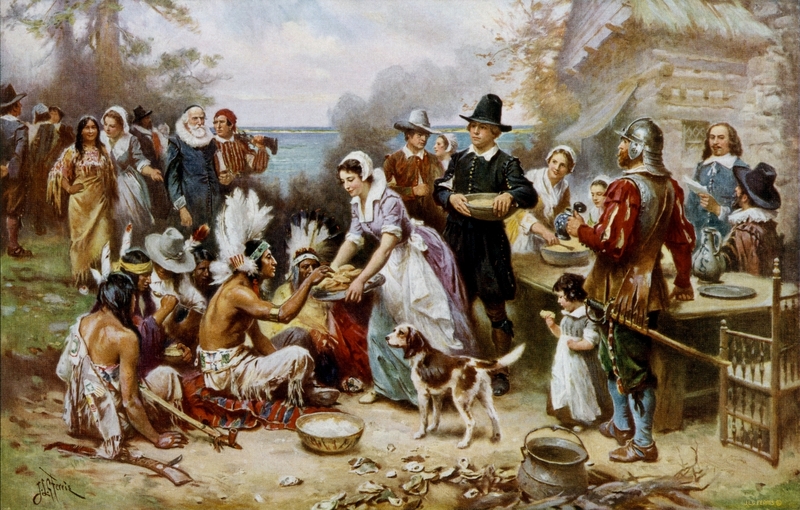 This entry was posted on Wednesday, November 24th, 2010 at 9:14 am	and tagged with American History, Edward Winslow, History, Pilgrims, Plymouth Colony, Plymouth Massachusetts, Thanksgiving and posted in Plymouth Colony and Pilgrims. You can follow any responses to this entry through the RSS 2.0 feed. Reblogged this on Historical Digression. Thanks Patrick. Have you read Mayflower by Nathaniel Philbrick? Fascinating detail, from England to the Atlantic Ocean to Provincetown (as it would become called) to Plymouth. I have Jim, and refer to it often. Excellent book.